The second floor is entered by the staircase entrance from the first floor, and contains the master bedroom, en-suite bathroom and small office space. The second floor provides the spacious living area that is the master bedroom with an en-suite bathroom. There is ample storage in the large walk in cupboards and enough space for a small office. The second floor, like the first floor North side, also has panoramic views overlooking the Oval and across to Arran. There are 2 small windows overlooking the kitchen area and the rear garden. There is also a skylight on the roof. 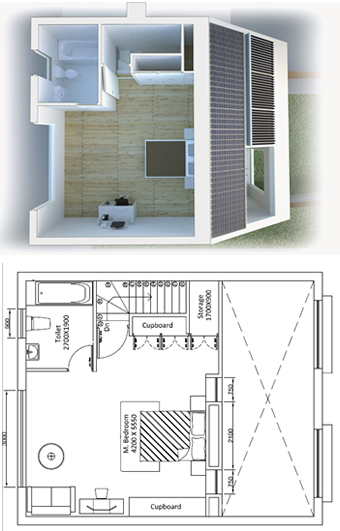 This ambient design ensures complete privacy for the resident and does not overlook any other neighbouring properties. It is common for similar properties in this area to convert the loft space to accommodate a second floor bedroom.